Everything's okay, or at least, will be okay, according to Skullgirls developers Lab Zero: the game will live on. 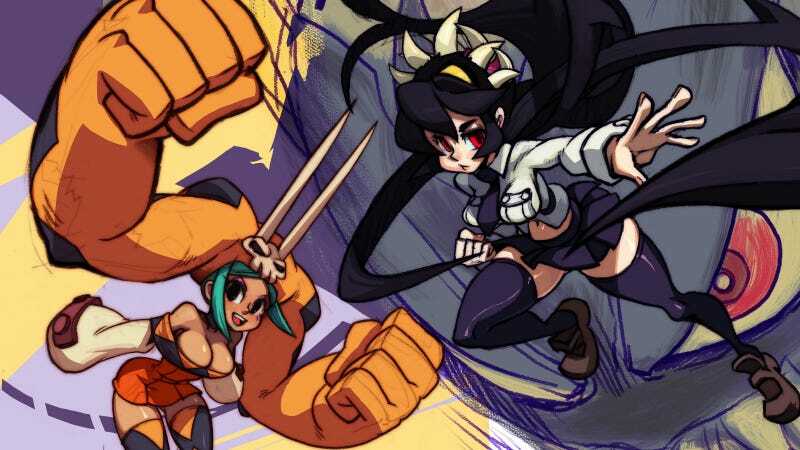 As you might recall, following Lab Zero's and Konami's parting of the ways, hand-drawn fighting game Skullgirls was slated for de-listing on the Xbox Live Arcade and the PlayStation Network. It still is—the game will be removed from both services on December 31. Lab Zero, however, managed to find new publishers for the game, which will be sold in 2014 as Skullgirls Encore. Encore will behave differently on each platform: the PSN version will count as a separate, new game, meaning achievements, leaderboards, and saves will be wiped, and previously bought DLC will be rendered incompatible (to counter this, Lab Zero will make the all-encompassing Color DLC Bundle free for a limited time). On XBLA, the game will receive a patch. From a technical standpoint, it will be the same game, so achievements, leaderboards, and saves will remain intact, with DLC remaining compatible. Regardless, the Colors Bundle will be free for a limited time here as well, but since the game's new build cannot be submitted to Microsoft until after the holidays, transitioning to Encore and re-listing will happen later compared to PSN. Encore will be free to Skullgirls owners on both platforms, and the original version will remain playable as the transition takes place. As to when people can actually buy the game again, Lab Zero has the rough estimate of "sometime in January 2014." And here's a little bit of good (better) news: Squigly, the first DLC character, will also be made available on consoles at the same time—naturally, for free.